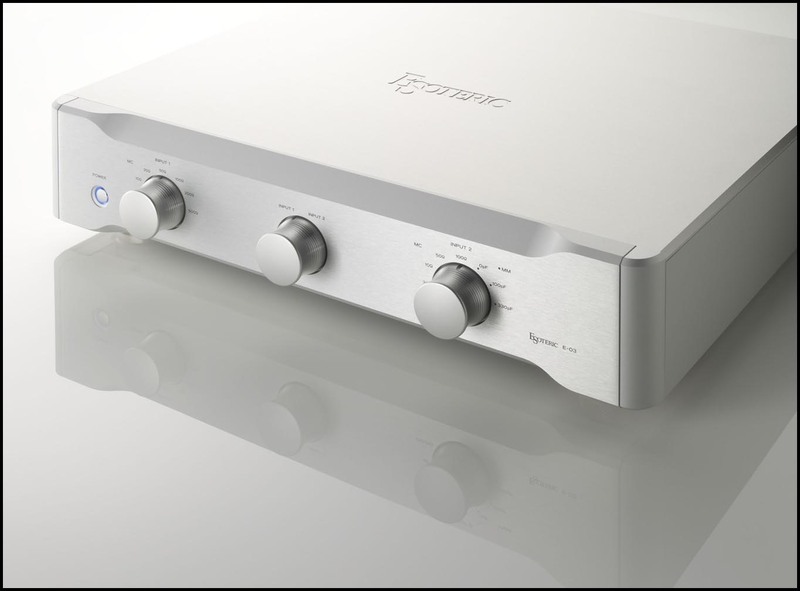 I don’t think anybody expected Esoteric to launch a phono preamplifier, ever. Yet here it is. I am quite sure that admirers and detractors of the brand alike have been wondering what has gotten into the otherwise rather predictable Japanese manufacturer. What I was wondering when I received one of the very first E03s to make it to the US - were they simply plugging a hole in an otherwise superb product line; or making a statement? Knowing just how much Esoteric's president Ohmachi-san loves vinyl, I expected the latter and was not disappointed. What I was not ready for though is just how much of a statement Esoteric would make. I have not reviewed all of Esoteric’s gear but have written about quite a few components, have heard many more and even own an X03SE. Yet to date, the E03 is simply their best piece of equipment—or at least my favorite of those I have heard—and that includes the Blue Moon recipient C03 preamplifier. The biggest surprise in that context may actually be that the E03 does not seem to bring any revolutionary technology to the table. Like many of Esoteric’s latest additions to the 03 Series, it builds upon trusted solutions simply pushed to their very limits in terms of execution. There is thus very little to write about except to mention fully separate left and right signal paths housed on two separate boards with separate transformers and all discrete components without a single microprocessor in sight to avoid noise contamination. The only technical novelty—possibly—is the use of high-voltage circuits for the RIAA amplification and output buffers, inherited I presume from the C03 preamplifier which also runs high voltage rails for optimized dynamics and transparency. Like in the C03 and A03 previously reviewed, components are placed symmetrically on the boards to provide mechanical stabilization in addition to each board being in its own enclosure to minimize resonance. To finish introductions, the E03 provides two inputs, one for MC (66dB gain) with seven loading options; and the other for either MC (66dB gain) or MM (40dB gain) cartridges, this one with four resistive and three capacitive loading options for MC/MM respectively. 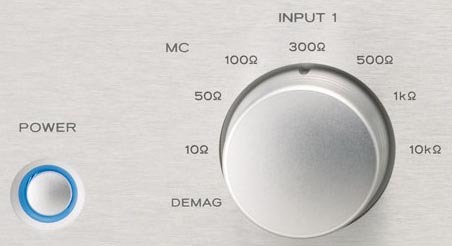 This second input is very useful for people who switch regularly between MC and MM but have only one tonearm. At least they do not have to change input cabling each time they change cartridge type. Selection of loading and input occurs at the front panel through rotary selectors which activate relays on the input boards. 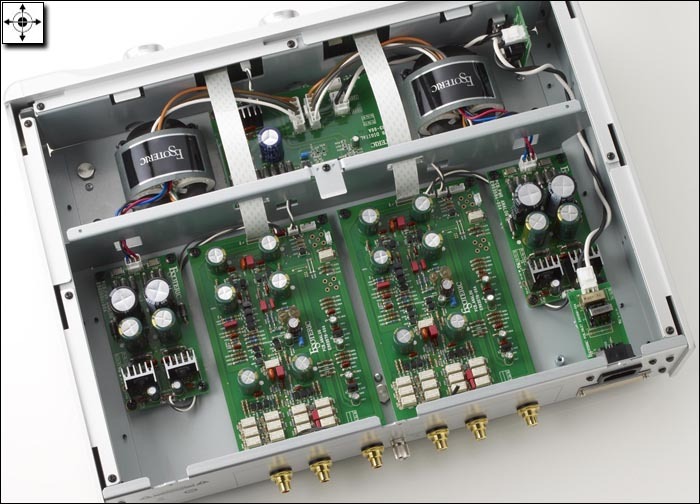 Why cannot all manufacturers of high-end phono stages implement such a convenient solution? Instead they force us to deal with small jumpers to be inserted at the back or inside the component. I just don't get it. And don’t drink the Kool-Aid meant to preserve transparency either. 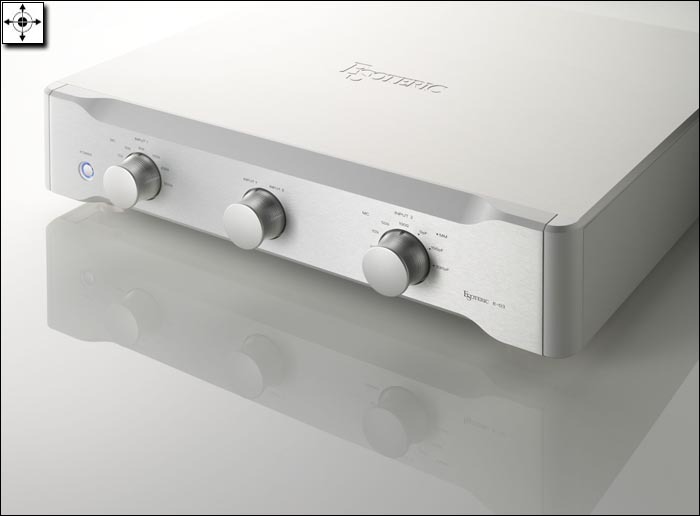 The E03 is by far the most transparent phono preamplifier to come through this house at any price - and it has no jumper in sight. One feature that I found more useful than expected is the presence of a cartridge and transformer demagnetizing setting. All it takes is to play a record for 30 seconds with the selector in the Demag position to conveniently demagnetize the cartridge. I won’t come back to this feature later so I might as well tell you right now that it does work! As with most demagnetizing tweaks, the effect is not night and day but clearly audible; the primary difference being a more relaxed treble and upper midrange and a hint more fluidity overall. Again, not a huge difference but considering how easy the operation is here, well worth the effort every few days.